Nevin Hamilton is the founder and head instructor of GOALIEDEV. Nevin is an accomplished goalie boasting over 15 years of top tier playing, instructing and coaching experience. Nevin personally oversees all training sessions and all camp instruction. Nevin attended Marian High School where in just his sophomore year he was named the Catholic Central league MVP and Best Defensive Player as well as being selected to the Metro-West and Boston Globe All scholastic teams. Following his MVP year, Nevin made the jump to the Boston Junior Bruins of the Eastern Junior Hockey League where he played from 2001 to 2005. 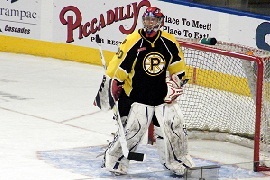 In his five seasons with the Boston Junior Bruins, Nevin was named the top goalie in the league three years in a row and was the playoff MVP during their championship run in 2005. From there, Nevin earned a D1 scholarship to play in the Hockey East at his alma mater UMass Lowell. During his junior year at UMass Lowell, Nevin helped backstop the team to a berth in the Hockey East Championship game. Nevin graduated in the spring of 2010 and left the school tied for the best save percentage in school history. Post college, Nevin spent time with the Providence Bruins (AHL), Wheeling Nailers (ECHL), and the Louisiana Ice Gators (SPHL) before turning to coaching and instructing full time. Nevin has been a goalie instructor/coach for over 10 years including serving as head goalie coach as well as head coach for the Boston Junior Bruins where he coached his 2015 Elite team to a USPHL championship and capped the season with a National championship. More importantly, 13 of his players last season received offers to play college hockey at the NCAA level and his goalies were rated among the league’s best. All of our instructors play or have played at the junior, college, and post-college levels. Under Nevin’s direction, each instructor operates under the mission of developing a goaltender’s potential and each possesses the knowledge and experience that is required to communicate and teach the GOALIEDEV Method. Our instructor’s wide-range of playing and coaching experience helps them to both connect with our goaltenders as well as provide the best learning environment for our students.